Quiz: Are you smarter than an 8th grade Civics student? Flash cards. They may bring back memories of studying for a big exam like the SAT or GRE, or they may remind you of elementary school when they were used as a great way to learn your numbers and letters. But did you know that the US Government Printing Office produces flash cards for the U.S. Citizenship and Immigration Services’ Office of Citizenship under the Department of Homeland Security? This week marked an important milestone for all U.S. citizens as the 225th anniversary of the signing of the Constitution of the United States of America. September 17 is now commemorated annually as Constitution & Citizenship Day, a time to reflect on the rights, honors and privileges of being a U.S. citizen, so I thought it was a perfect time to introduce our readers to the Civics Flash Cards. The Civics Flash Cards are one of the most popular products sold in the US Government Bookstore as a tried and true way for immigrants and to learn about U.S. history and government while preparing for the United States naturalization test. These easy-to-use flash cards (available in English and now also in Spanish) contain each of the 100 civics questions and answers contained on the United States naturalization test, and are updated when there is a change of leadership in the White House or Congress. The Civics Flash Cards also feature interesting historical photos and relevant captions, thus providing additional civic learning opportunities, making them ideal not only for use as an instructional tool for U.S. citizenship preparation, but also in standard American social studies classes or home schooling. For example, one card contains a picture of Jeannette Rankin, the first woman to be elected to the U.S. House of Representatives, while another shows Hiram Revels of Mississippi, the first African American U.S. Senator, elected in 1870. Recién actualizadas para 2012, las Tarjetas Flash de Educación Cívica en Español ayudarán a a los inmigrantes a aprender sobre la historia de los EE.UU. y del gobierno mientras se preparan para el exámen de naturalización. Estas tarjetas de memoria fáciciles de utilizar contienen cada una de las 100 preguntas y respuestas cívicas (sobre la historia y el gobierno) del exámen de naturalización estadounidense, y conllevan fotos históricas y leyendas pertinentes a que proporcionen el aprendizaje cívico adicional. Failing grade in civics for American kids… and maybe their parents? In 2010, The Department of Education administered the National Assessment of Educational Progress or NAEP test, known as the nation’s report card, to 27,000 4th-, 8th- and 12th-grade students throughout the United States. Reading through the flash cards, it makes me wonder how many native U.S. citizens— parents and children— could correctly pass the test given to immigrants aspiring to become citizens? 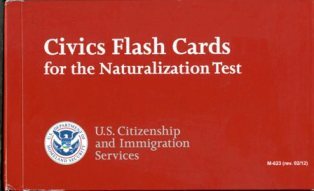 HOW CAN YOU OBTAIN a copy of the Civics Flash Cards for the Naturalization Test, either the English Version or the Spanish Version? Buy them at GPO’s retail bookstore at 710 North Capitol Street NW, Washington, DC 20401, open Monday-Friday, 9am to 4pm, except Federal holidays, (202) 512-0132. Find them in a library. You may also be interested in our other Constitution and Citizenship products, such as the pocket edition of the Constitution and Declaration of Independence. Click here to shop our entire Citizenship Collection. 1) Which of these does NOT represent one of the powers of the Federal Government under our Constitution? To provide protection & safety such as police and fire services is a function of state and local governments. 2) Which of these are responsibilities that are only for United States Citizens? Only citizens may vote in a Federal election, serve on a jury, or run for Federal office such as U.S. Senate or House of Representatives and for most state and local offices. Unfortunately, everyone has to pay Federal taxes, citizen or not! 3) Which of these states does NOT border Canada? Of all of these, only Wisconsin does not share a border with Canada. All the international border states with our northern neighbor are (east to west): Maine, New Hampshire, Vermont, New York, Pennsylvania (border on Lake Erie), Ohio (also border on Lake Erie), Michigan, Minnesota, North Dakota, Montana, Idaho, Washington and Alaska. About the Author: Michele Bartram is Promotions Manager for GPO’s Publication and Information Sales Division and is responsible for online and offline marketing of the US Government Online Bookstore (http://bookstore.gpo.gov) and promoting Federal government content to the public.